Food, glorious food! While I’m no foodie or food blogger, I’m still human and I do love to taste delicious foods when I travel. I’m not so keen on tasting non-delicious foods when I travel but sometimes you don’t know until you try, right? 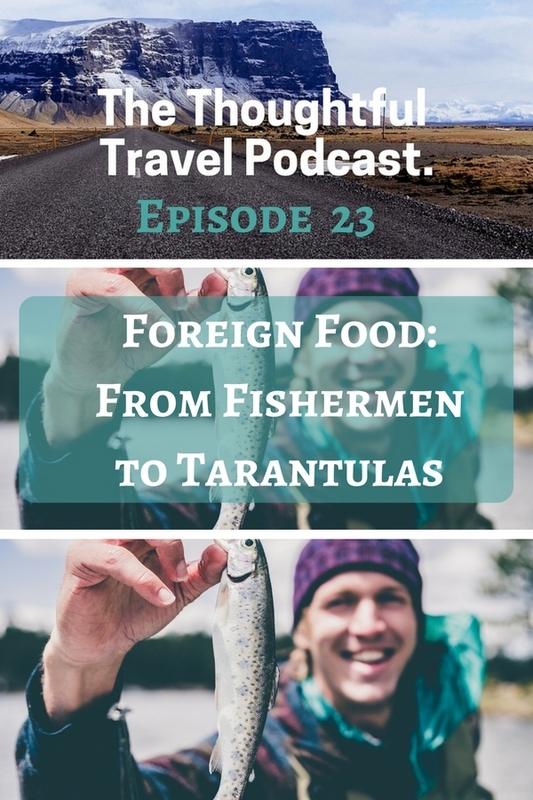 This episode of The Thoughtful Travel Podcast features three different tales of food while travelling and I especially love Lola’s take on the topic, which is all about getting back to basics and exploring the foods of a country right at the source. I don’t exactly advise being hungry when you listen to this episode, though, as some of it may turn you off food for a while! Are you an adventurous eater? I’m not particularly brave but I’ll eat virtually anything when it’s required to be polite. The topic of food in foreign countries is always a fascinating one and today’s episode addresses it on a couple of different fronts. To start with, I speak with Lola Akinmade Åkerström, who has built a fabulous career as a travel writer and photographer. One way she approaches foreign food is to get down to grass roots level which has seen her chatting with farmers and getting up very early to go out with fishermen. The next guest is Martin Bailey, another travel photographer who is based in Japan. It’s his decades of experience in Japan that led him to talk about some of the more unusual food experiences you can encounter in Japan, and they are not all experiences that I’d like to repeat! Jean Cheney of Traveling Honeybird has also eaten some particularly interesting foods in her time, and she discusses some of the meats she was served up in Mongolia, among other tasty treats she’s seen around the world. Yes you’re much braver than me Aleney! Really enjoyed your podcast Amanda! Your guests were very interesting and I quite enjoyed the story about the sparrows. The podcast was right up my alley! Nice work! So glad you enjoyed it Markus and yes, how handy that this was a food episode, perfect for you! !